Epiphytes, or air plants, grow everywhere but can be found mainly on the branches, trunks, and even the leaves of trees. The name ‘epiphyte’ comes from the Greek word ‘epi’ meaning ‘upon’ and ‘phyton’ meaning ‘plant’. 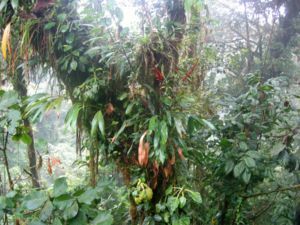 Different types of epiphytes may grow on the same tree, including orchids, cacti, bromeliads, aroids, lichens, mosses and ferns. They begin their life in the canopy from seeds or spores transported there by birds or winds. Epiphytes are large and can grow over twenty yards long these plants are a perfect habitat for certain animals living in the wild, such as Frogs, small Birds and insect all searching for cover from there Predetors, they usally die in the rain forest after 7-9 years when they die the drop from the tree and the soil absorbs it.